Forbes is reporting that "Canadian billionaire Bernard "Barry" Sherman and his wife, Honey, were found dead in their Toronto home Friday, and police are reportedly investigating their deaths as suspicious. A spokesperson for Apotex, the generic drug giant Sherman started, confirmed the couple's deaths Friday." The CEO of a giant generic drug company is found dead along with his wife. What's not suspicious about that? The Great Canadian Pharmaceutical Fraud continues. Apotex is a Canadian pharmaceutical corporation. Founded in 1974 by Dr. Bernard Sherman, the company is the largest producer of generic drugs in Canada, with sales exceeding $1 billion (CAD) a year. Aren't the mainstream pharmaceutical companies opposed to affordable generic drugs? Aren't they obsessed with rigid patents that gives them a monopoly to extort patients who are dying at will? White collar crime is big business so it is. I've heard of hostile takes overs before but this is ridiculous. Drugs made in China: opportunity or threat? The National Pot is reporting that "The couple were found hanging side by side next to their indoor pool, sources independently told the National Post and the Toronto Sun." "The Shermans were among Canada's most generous philanthropists and also organized funding for charitable causes through the Apotex Foundation. The couple made numerous multimillion-dollar donations to hospitals, schools and charities and had buildings named in their honour." 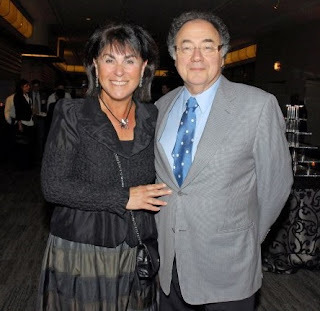 Update: The Canadian Press is reporting that "Homicide detectives have taken over the investigation into the deaths of billionaire Barry Sherman and his wife Honey after autopsies revealed the couple died from ligature neck compression, Toronto police said Sunday night." "Ligature strangulation is a type of strangulation that occurs with the use of a mass that is not the body weight. In other words, ligature strangulation does not require suspension of the physical body. Instead, it requires the use of a cord-like object, such as a rope." The Israel National News has picked up on the story. Evidently Dr. Sherman was Jewish. The New York Times is reporting that "Barry Sherman, a Canadian billionaire, generic-drug mogul and philanthropist, once promised that the autobiography he was writing would be a page-turner, packed with stories of intrigue, duplicity and outright corruption by his competition. Now he's dead before the book could be written. Imagine that. Looks like we are going to have to zero in on the coruption he was going to expose. The Toronto Star is reporting that "It has since been reported that Apotex under Sherman launched hundreds of lawsuits against competitors, including pharmaceutical giants such as Pfizer Inc. and Merck & Co., to overturn patent protection for their medicines, as well as against government regulators who made decisions it disagreed with." The government should not be supporting these rigid patents. Update: CBC is reporting that "Private investigators believe that the billionaire Toronto couple found dead at their home in December were murdered by multiple killers. Their wrists showed evidence that they had been, at one point, bound together. No rope or other materials that could have been used to tie their wrists were discovered, the source told CBC Toronto." Now what would a nice Jewish businessman like Barry be doing with a nasty Mafioso sleazebag like Frank?! Frank Forensics: Who Killed Barry and Honey Sherman? Thanks for the links. Merry Christmas.